Add oil and onion to large skillet. Stir and saute over medium-high heat (350 degrees in an electric skillet) until onion is clear. Add cranberries and garlic. Continue to saute for 2 to 3 minutes. Add kale. Pour or squeeze orange juice over top of kale. Continute to stir fry for about 5 minutes until kale is wilting and hot. 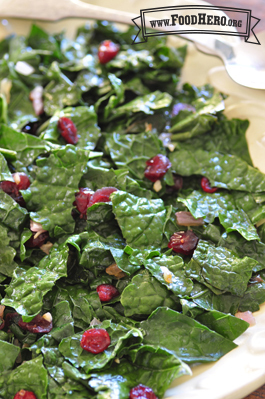 6 Comments for "Kale and Cranberry Stir-fry"
Works well with fresh spinach too. Great quick recipe for all the kale in my garden! We didn't use the onion...it turned out so well and everyone had seconds. I didn't think *I* liked kale either, but I made this for a presentation at a farmer's market, and it was really good! For the other kale newbies: 6 cups of kale *looks* like a lot, but it cooks down to a manageable amount of food. The red cranberries are very festive against the greens, and I'll definitely be including this dish at my holiday table. A very tasty and quick way to serve kale! If there are leftovers, add a splash of balsamic vinegar and serve as a salad for lunch the next day. I didn't think I liked kale until I tried this recipe - now I make it at least once a week! It is super quick and has tons of flavor. I added unsalted sunflower seeds the same time I added the cranberries and garlic. This added an extra little crunch and was a hit with everyone over for Thanksgiving!